Rome. June 21st. It is a reported 34 degrees Celsius in this great city. Oy. 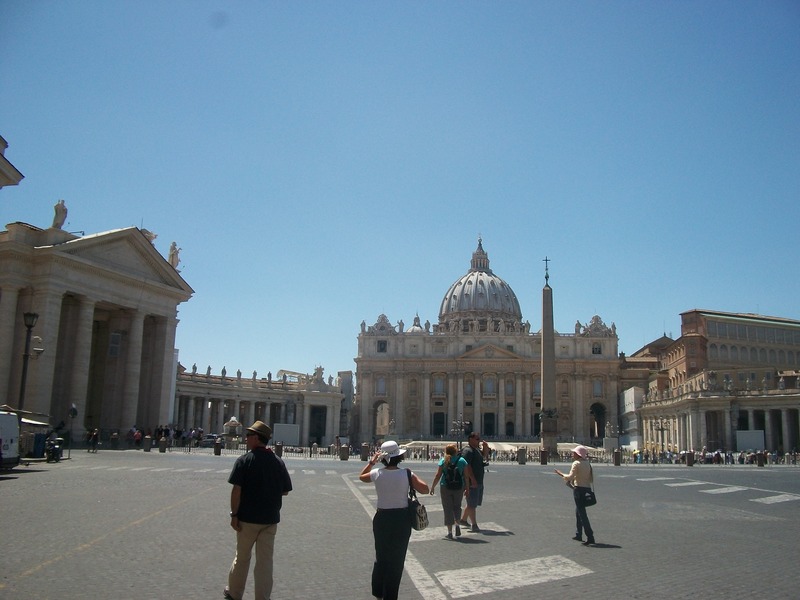 And I swear that the temperature rose another 5 degrees as I stepped onto the Piazza San Pietro. With less than 24 hours in Rome, it was difficult for me to decide how exactly I should spend my time in this historic city. The first thing that I do in a new-to-me place when I travel is I find a map. But after taking a look, I am boggled by the sheer number of Cathedrals, hills, piazzas, ruins, and other sites that dot the map; the many sites that evolved out of Rome’s 3000 year history of debauchery, political upheaval and – let’s face it – the city’s amazing capacity for technological development and social change. I settled on St. Peter’s Basillica, hopped a city bus and made my way to the west part of Rome. As we rambled over the Ponte Vittorio Emanuele that spans the Tiber, I could see the dome of St. Peter’s rising up out of the crops of buildings that populate Vatican city. To my right, Castel St. Angelo. She sensed that responding in Italian just wouldn’t help me out at all. Good call. 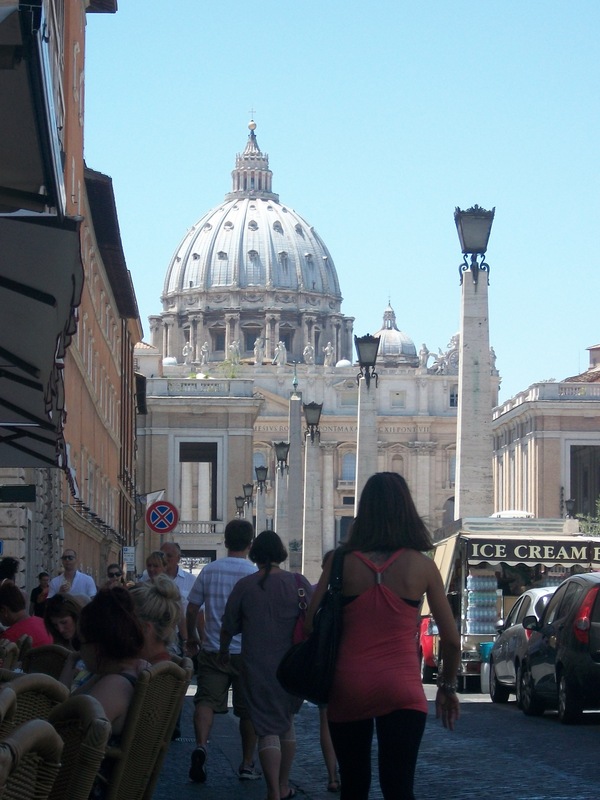 Via della Conciliazione is the street that runs directly to St. Peter’s. I decided to break for lunch before heading to the Basilica. While I picked away at my insalata nicoise and sipped white wine, a total of 12 priests and 18 nuns walked by (but who’s counting?). One of the nuns (an older one, by the way) was texting furiously on a mobile device. I found this odd and amusing all at the same time. But nothing prepared me for St. Peter’s Basilica. Standing in the Piazza, taking in the sheer scale and its historical significance was absolutely unbelievable. It was almost surreal. I roamed about taking photos and marveling at its design and details. Remarkable. Of course, my next mission was to get inside the Basilica. Unfortunately, this was ‘impossibile’. I had on a tank top and shorts. I really should have done my homework ahead of time. So my fellow travelers, take note! If you are ever in Rome and want to enter into St. Peter’s Basilica, don’t forget that there is a dress code. I spent a good hour and a half in St. Peter’s Square and the heat was almost suffocating (I didn’t have any sunscreen on either). I opted for a ‘hop on, hop off’ tour bus to make my way back in the direction of Roma Termini. This was a great way to see the city in a short period of time (it included audio tour). We weaved through Rome’s narrow streets passing by the Foro Romano (new to me), the Colloseum (wow), and the Campidoglio (impressive) (photos here). I really liked seeing the Circo Massimo, the place where they held chariot races so many centuries ago. At the time, the facility could accommodate almost 300,000 spectators! Update: I just found out that there is a public transportation train strike on today in Rome. I am not sure what this means in terms of getting to Naples as was planned. I await my colleagues’ arrival today at noon and we will carve out a strategy. Worst case scenario: we stay another night in Rome. I’m ok with that. No burning need to leave this great city.